With the majority of cancers occurring in individuals over the age of 65 against a backdrop of an expanding aging population, there is an urgent need to integrate the areas of clinical oncology and geriatric care. This timely work tackles these issues head-on, presenting a truly multidisciplinary and international perspective on cancer and aging from world-renowned experts in geriatrics, oncology, behavioral science, psychology, gerontology, and public health. 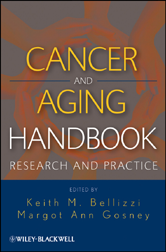 Unlike other books on geriatric oncology that focus mainly on treatment, Cancer and Aging Handbook: Research and Practice examines all phases of the cancer care continuum, from prevention through evidence-based diagnosis and treatment to end-of-life care. Detailed clinical and research information helps guide readers on effective patient care as well as caregiver training, research, and intervention. Coverage includes: - Epidemiology of cancer in older adults, plus the unique physical, mental, and social issues involved - Strategies and guidelines for prevention, screening, and treatment of older individuals with cancer - The most common cancers in the elderly, including breast, colorectal, lung, prostate, and ovarian cancer - Cancer survivorship in older adults as well as the all-critical issues of palliative care and pain management - Emerging topics such as caregiver and family issues, different models of care, and cost considerations An essential resource for clinicians and caregivers as well as researchers interested in this evolving field, Cancer and Aging Handbook is also useful for public health professionals and policymakers who need to formulate services and allocate resources for the growing population of older cancer patients.